Justin Sullivan/Getty ImagesNew York Sen. Kirsten Gillibrand speaks at a press conference on Capitol Hill. Sen. Kirsten Gillibrand on Friday said the US Senate should not vote on a new FBI director until either Congress or the Department of Justice appoints a special prosecutor to lead an investigation into President Donald Trump’s potential ties to Russia during the 2016 campaign. Speaking at the Common Good forum in New York City, Gillibrand argued that Trump has “tried to undermine the basic institutions of our democracy,” by firing former FBI Director James Comey earlier this week, saying Trump was further politicizing the department. Since Comey’s departure on Tuesday, Democrats across the board have urged Republicans leaders to appoint a special prosecutor, arguing Trump’s firing was linked to Comey’s widening probe of Trump’s campaign, and dubbing the move Nixonian. House Speaker Paul Ryan and Senate Majority Leader Mitch McConnell have demurred against such a move, saying they had confidence in ongoing investigations within the FBI and House and Senate committees. “I think the intelligence committees are the ones that should do this, because, don’t forget that the methods and sources of our intelligence gathering are also at play here, and we have to be very sensitive so that we don’t compromise that information as well,” Ryan told Fox News this week, referencing Trump’s complaints about leaks of information from law enforcement and intelligence agencies. Gillibrand, seen by some Democrats as a rising star, has emerged as one of the most outspoken Senate opponents to Trump’s agenda. Long viewed as a center-leaning Democrat, she voted against 20 Trump administration nominees, more than any other Senate Democrat. 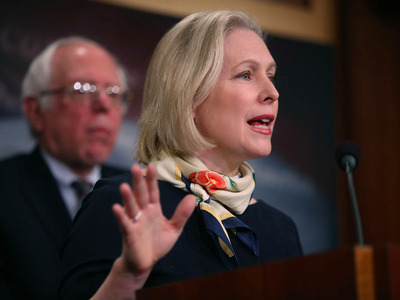 Despite broad speculation about a potential 2020 presidential bid, Gillibrand said earlier this month that she was focused on her 2018 Senate reelection. “I’m focused entirely on running for Senate, so yes, I’m ruling it out,” she told reporters last week when asked about a 2020 presidential bid.